WESTS Ken McCrohon gave one of the best exhibitions of fullback play seen in Brisbane for several seasons as the Panthers finished clear cut 35-18 winners over Brothers in a stirring grand final at the Gabba. McCrohon, who would go on to play for Australia two years later, was largely responsible for rallying Wests when Brothers were playing all over the Panthers mid-way through the second half. The Armidale (northern New South Wales) product smashed rivals in defence, made the right calls in possession and proved elusive when he took on the line. “When things looked black for Wests, McCrohon turned defence into attack with a dodging run,” wrote The Courier-Mail’s Jack Reardon. “But the highlight of his play was a diving tackle on Brothers’ winger, Johnny Craven. Reardon described the grand final as one of the cleanest he had covered. Brothers trailed 15-2 at halftime and 20-2 a few minutes after the resumption, but fought back in wonderful fashion to be behind only 20-15 and then 25-18. Ultimately it was Wests weight and experience which won out, as well as the brilliance of McCrohon and Test centre, Alex Watson. Watson scored two glorious tries and kicked four goals, before being forced from the field 10 minutes into the second half with a fractured collar bone. Brothers’ best were Paul Lacaze, Ron O’Malley, Fred Proberts and Brian O’Connor. 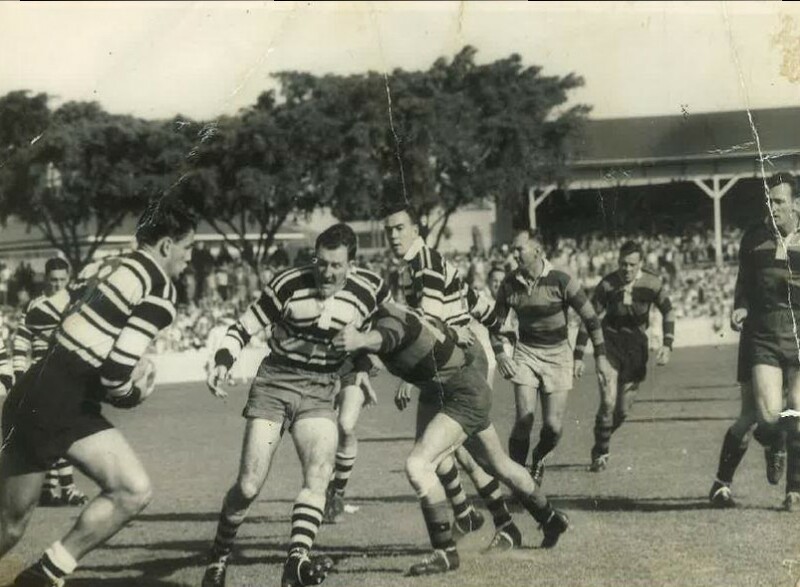 Action from the 1956 BRL grand final at the Gabba, between Brothers and Wests. Any help identifying players would be welcome. Photo courtesy of the Melit family.